When you’re trying to find ways increase your income, sometimes it’s best to not over think it. Earning extra money can be easy when all you have to do is share your views and give honest feedback. When companies say that they value your opinion they really do; So much that they are willing to pay you for your well thought out feedback and insight. 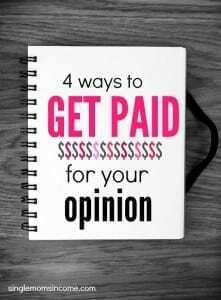 Here are 4 different ways you can earn money by giving your opinion and over fifteen places you can sign up with. Taking surveys is one of the most common ways to earn money by giving your opinion. Companies really depend on and value consumer feedback as it helps them improve their products and services. 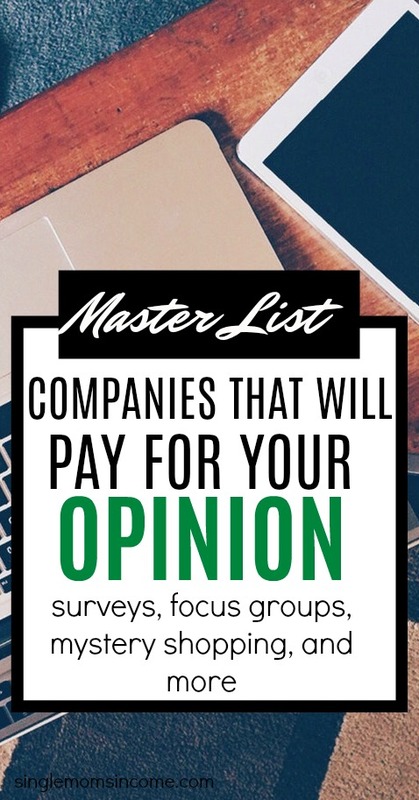 Contrary to popular belief that survey companies are scams, there are legitimate ones out there and you’ll need to make sure you work with a survey company that is associated with an actual market-research company. While I’m not positive that you can make serious money by taking surveys (I never made a ton of money), it’s very easy to get started and earn a little extra money in your spare time. When you’re on the computer surfing the web, all you have to do it take a few minutes out of your day to give your honest opinion about a wide variety of topics and products. As a mystery shopper, your job is to observe and assess specific aspects about a company’s products and services. This usually involves purchasing something but you always get reimbursed afterward. After each visit, you fill out a report and give your opinion about the service you received, the cleanliness of the establishment, whether the employees were friendly or not, and any other details that are required for that particular job. To get started you have to sign up with a company and fill out a profile. Once all the technical information is gathered you can begin to bid on jobs. Most mystery shop companies will send out jobs that you can request to do instead of assigning you consistent work. This could be a turn off for some people but there is usually plenty of work to go around and you just have to stay on your inbox for email alerts. You can also check out this post for 6 mystery shopping companies with an A+ BBB rating. When you use a new product, your first reaction may be to tell a friend or family member about it. But do you ever consider that your feedback could be worth money? 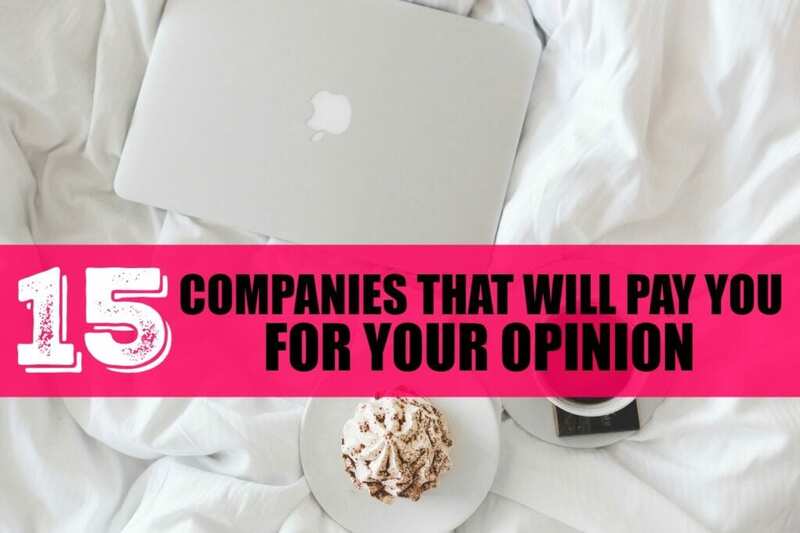 Reviewing products and services online is another easy and quick way to earn money simply by giving your honest opinion. Word-of-mouth referrals are still extremely popular and a majority of internet users search for reviews on a product or service before making a decision which can make your review vital to a business. Vindale – Vindale Research is primarily a survey company but they pay you to give reviews on products you use. I love how they share real photos of members actually receiving their checks from writing reviews. You can earn $2 just by signing up and completing your profile. Expo TV – This is a fun site that pays you to give video reviews on your favorite products from popular brands like Tide, Bounty, and Acer. It’s kind of like making your own little commercial/review for the products you use all the time. I could personally see myself having too much fun on this site. User Testing – I used UserTesting to have someone review my blog before, but I recently learned that in addition to receiving reviews, you can make money by giving reviews as well. (You can earn around $10 for a review that takes around 20 minutes!) You should sign up with UserTesting if you’d like to do audio reviews for websites, mobile apps, prototypes and more. A few other ladies and I met in a beautiful building in downtown Chicago where we received food and drinks while discussing several different hair care products. I answered questions based on my own personal experience and chimed in whenever necessary. After an hour long discussion, we each received $100 and went on our way. 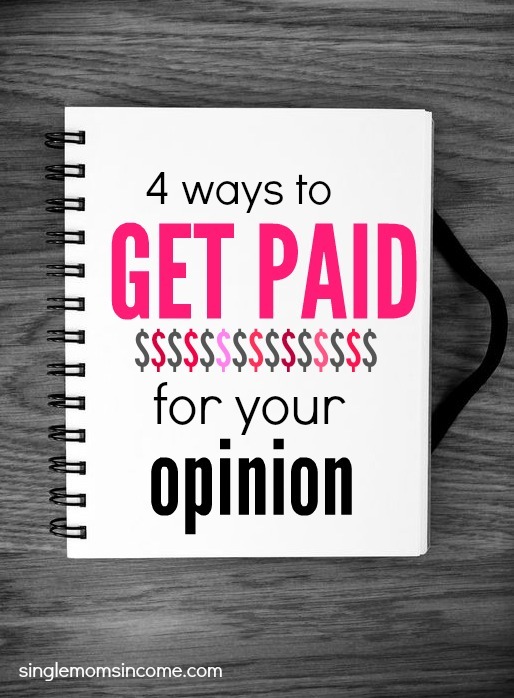 Have you ever tried to earn money by giving your opinion? Which one of these techniques would you try? I joined a couple of other survey sites and I found that most of them want your home phone number just so that they can share that number with tele marketers. Do you know a way around that? I can’t speak for everyone else but I can’t find anything more annoying. Surveys and giving Reviews are a great way to earn money while you’re doing something else, like watching TV or just relaxing. The payout can be a little lackluster, but it’s a good way to get started earning extra. Note about MyPoints: I’ve made money from this company since 1999. It’s quick by stacking up 5 points for each email looked at. Some are more by signing up to receive info from other companies they offer, there’s videos to watch & more ways to stack up points. I purchase lots from Walmart online & do it through MyPoints & get many points & % off too! I don’t know money value of all gift cards received but I’m still going strong with them…love it! Sorry, fingers spelled my name wrong, go figure! I would like to ask if these online jobs are okay if you are not U.S based? and if they will pay you correctly? Thanks! and by the way, i love your site! Girl power! Thank you 🙂 To be honest I’m not sure if all of them are open to residents outside of the US. This is a super post! I am actually trying to do a case study on how much surveys can make in a month. I have not come to a conclusion yet. But certain sites like Toluna and Global Test Market have very interesting surveys. And you are right. They are not open to all countries. Why not pursue the singing with an emphasis on weddings. Good money.